In an effort to eat healthier, I sometimes switch to brown rice. I like the firmer texture and slight "pop" as I bite into each grain. 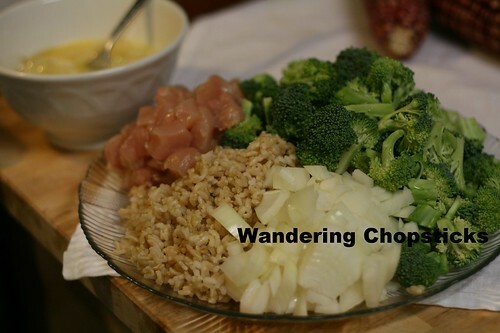 And while replacing white rice with brown rice doesn't really need a specific recipe, I thought it'd be nice to come up with fried rice recipe that would be healthier for you. This recipe would be right at home at P.F. Chang's or any Chinese-American kitchen. I would say it's healthy, but I'm sure someone will debate the nutritional value of rice, even if it's brown. Or chicken, even if it's breast meat. Or eggs, even if you used all whites, which I didn't. So! 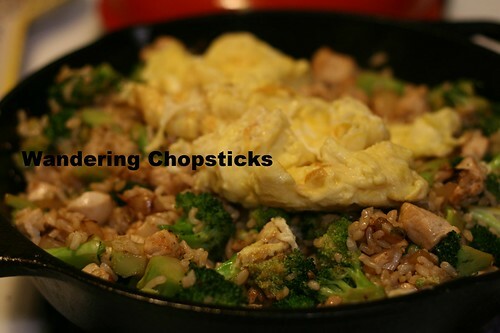 Healthier fried rice if you will. Because no one will argue with me that broccoli isn't healthy? And in the run-up to Thanksgiving, perhaps a slightly healthier meal is in order before you indulge? 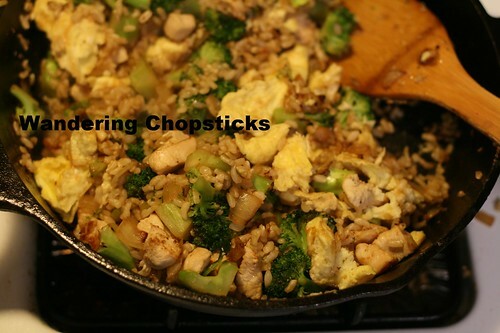 Fried rice is best made with day-old or cold cooked rice so make sure you have some on hand before you begin. Or cook a fresh batch of rice, fluff it up, and let it chill in the fridge. 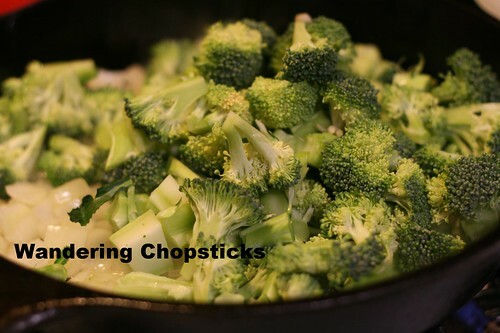 Cut broccoli into roughly 1- to 2-inch sections for ease in eating. Set aside. 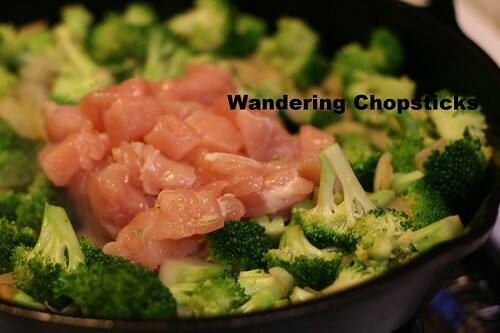 If you like your broccoli to be on the soft side, then parboil first before draining and setting aside. Dice the chicken breast into 1-inch cubes. Set aside. Dice 1 small onion. Set aside. Beat 2 eggs. Whites only if you want to be healthier. Add a pinch of salt if you wish. Cook them scrambled and then set aside. 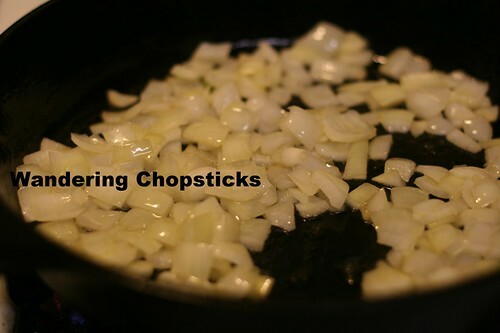 In a saute pan on medium-high heat, drizzle a bit of olive oil and saute the onion until softened. 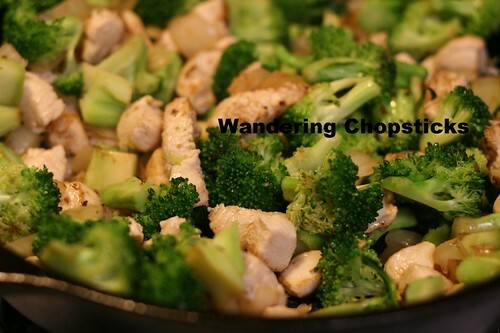 Add in the broccoli pieces and saute for a few minutes until the broccoli becomes tender-crisp. Add the chicken and saute until cooked through. 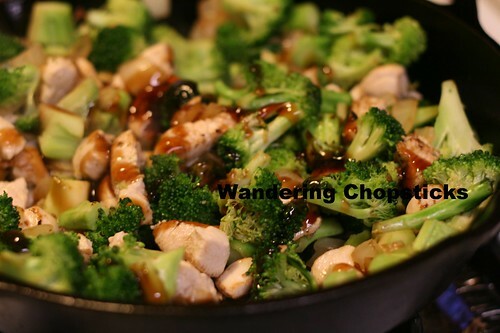 Looks like a delicious stir-fry! 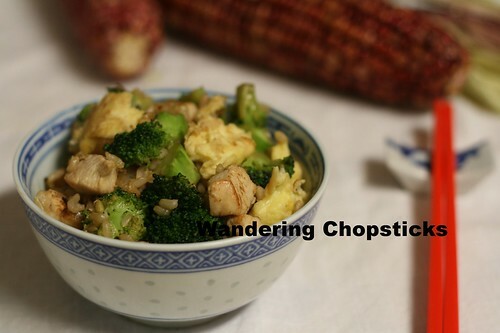 Add in a few drizzles of oyster sauce and mix. 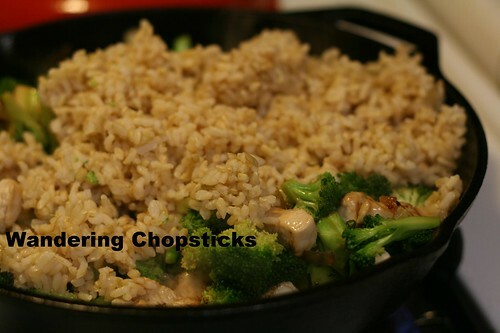 Add the brown rice and mix again. 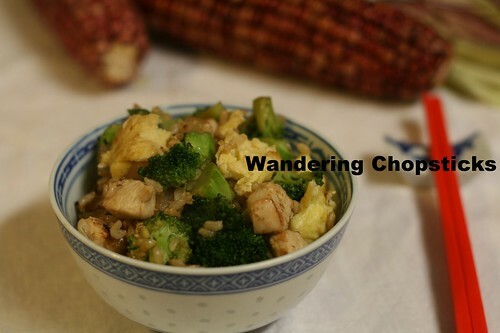 Taste and make sure you have enough oyster sauce to flavor the pan. Oyster sauce is salty; a little goes a long way. You don't want it saucy, just enough to give the fried rice some flavor. Then add the cooked eggs. Break up the egg into chunks and mix thoroughly. 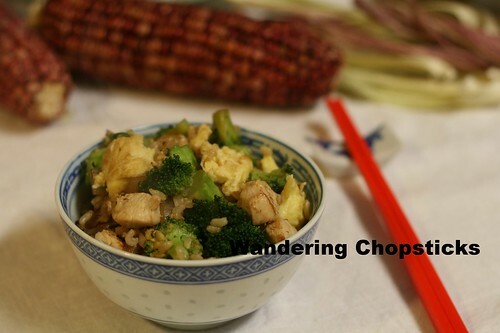 Healthier brown fried rice with broccoli and chicken. 1 year ago today, Seasons 52 - Costa Mesa. 2 years ago today, UCC Cafe Plaza - Walnut (Closed). 3 years ago today, The Huntington Library, Art Collections, and Botanical Gardens (Japanese Garden) (Spring) - San Marino. 4 years ago today, my review of 9 frozen turkey dinners in "Thanksgiving Dinner for 1 :( ." 5 years ago today, Coq au Vin (French Chicken in Wine), the meal I wished I had in Paris.